With a workspace free of major obstructions, the probe managed to deploy two of its primary instruments—the seismometer (aka the marsquake detector) and Heat Flow and Physical Properties Package (HP3), the latter of which was put to work for the first time on 28 February, according to the German Aerospace Centre (Deutsches Zentrum für Luft- und Raumfahrt, or DLR). 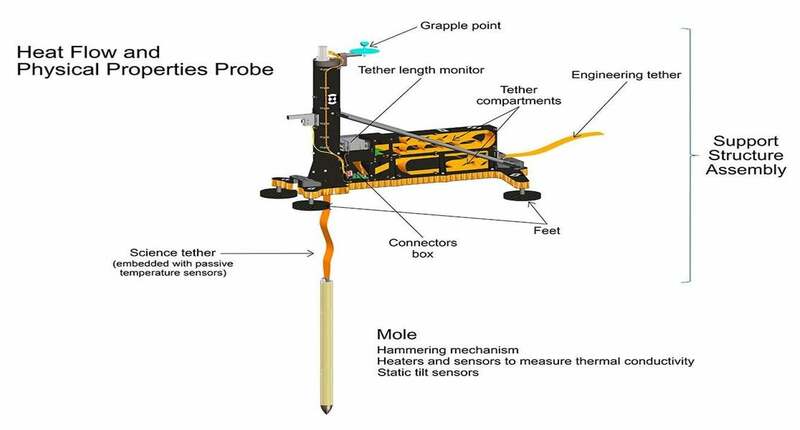 Nicknamed the “Mole,” the HP3 instrument is designed to drill into the Martian surface and, with a special cable equipped with sensors, take temperature readings along the length of the hole. During its first test, the Mole was shown to work, but it now appears that some inopportunely placed subterranean rocks could inhibit further drilling progress. The Heat Flow probe, developed by DLR and Polish engineering company Astronika, is equipped with a penetrometer—an autonomous, electrically powered hammer that drives itself deeper into the ground with each pulse. A gear stretches its main spring, producing the hammering, forward-thrusting action. A second spring absorbs the recoil. During the first test of the HP3 system last week, the device managed to drill down to a depth of 13 centimetres (5 inches) before hitting some rocks. Tests on Earth showed the Mole was capable of shoving smaller stones away, but in a process described as “very time-consuming,” according to DLR. The Mole then encountered another rock at a greater depth and was unable to proceed any deeper; mission planners were forced to stop after the four-hour drilling window expired. By the end of the session—some 4,000 hammer blows later—the Mole managed to drill down to a depth of 50 centimetres (19.5 inches). This, according to the Associated Press, fell far short of expectations. Another four-hour drilling session should happen soon, but mission planners have to wait for the system to cool down first. The hammering action causes friction, which in turn generates heat; several hours of hammering requires a two-day cooling period. Ideally, as the HP3 experiment proceeds toward the goal of drilling a hole 3 to 5 metres (10 to 16 feet) deep, the project will involve a series of four-hour drilling sessions, followed by two-day cooling periods and a day to take temperature readings.